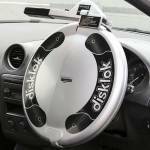 Disklok are manufacturer's of the UK's strongest steering wheel lock. Available in a choice of colours and sizes, suitable for cars, vans, 4x4s and motorhomes. If you're looking to protect your vehicle, look no further than Disklok - the UK's number one steering wheel lock, available online or from your nearest Carnoisseur Outlet.